Striking mini dirndl high necked with V-neck. Colour coral nature. Straightforward, traditional and classic. This is how the new mini dirndl in 58 cm skirt length from the Marjo collection looks. The Dirndl is made of 100% pure mercerised cotton, is therefore smooth and fine from the fabric surface and has, of course, especially in summer excellent wearing properties by the natural material cotton. Closed is the mini dirndl front with small metal trim buttons. The high-necked V-collar is fringed with a small ruffle and a contrasting decorative border. 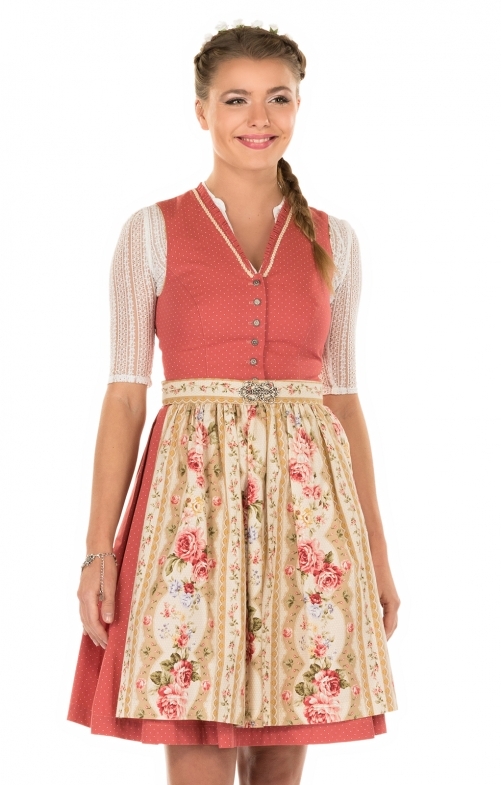 Very nice and very loving details characterize this short dirndl. The dirndl apron in rose motifs in a colour matching the colour of the mini headband is enhanced by a decorative brooch on the apron hem.